WRI recently announced a partnership with OpenAQ and Development Seed to help more users access – and contribute to – air quality data from around the world through the OpenAQ open source platform. This update, which originally appeared on OpenAQ’s Medium and has been adapted, explains some of the benefits. OpenAQ is ecstatic to announce that we are partnering with the World Resources Institute and Development Seed to open up air quality data from more sources and to scale our system to meet growing demand for data. The image below shows current country-level air quality data coverage across the world for the OpenAQ Platform. Significant gaps – the grey areas – remain, both in terms of countries not yet added and sources missing at the sub-national level. Our community of incredible users, WRI and Development Seed are helping to change that. When we started this project two years ago, we had a hunch that people and organizations would be able do awesome work in the fight against air pollution, if there were just easier access to even existing air quality data sources. And the projects behind the data requests are where the magic happens. Software developers have built tools communicating real-time air quality to the public (e.g., Smokey the Air Quality Bot, Open Air Quality App, Envi4All and hackAIR). Students have used the system for their classwork. Google’s public dataset program and various open-source projects (e.g., ropenaq, py-openaq and OpenAQ Data Visualizer) have helped make the data even easier to access and visualize. Companies have used the data to help calibrate their low-cost sensors or as a data layer for comparisons (e.g., Airveda and ARISense). Researchers have used the system to inform a real-time wild fire model and predict air quality in some of the most polluted places in the world. Seeing this usage has been incredible, but it’s also been pretty demanding on our current system, as those of you who follow along on our #dev channel on Slack may have already noticed. We need to scale. Move away from using the database as the main storage mechanism for the data. This will make the system less costly to maintain and more reliable for users. Implement rate-limiting to ~30 requests per minute or roughly 1,000 requests per hour. This will make the system more useable for everyone. 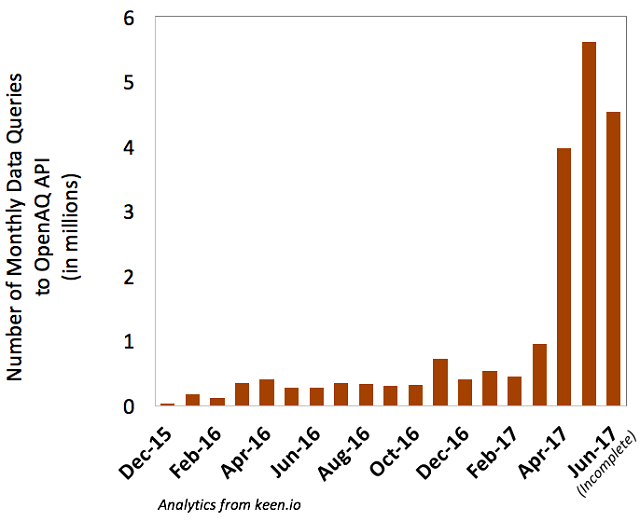 If you’re interested in seeing our progress over the next couple of months, follow along — or even participate, if you’re interested – via #dev on our Slack Channel. We are also adding more data. To date, we aggregate air quality data from 48 countries and 5,628 stations, largely through the incredible help of volunteers letting us know about government-level data sources and software developers who then are able to write adapters to ingest it (by the way, we looked this number up on Dolugen Buraalda’s handy site). This coverage is great. But there are lots of data sources missing – both from other countries and within the countries where we already access data. We estimate there are roughly 70 countries out there with real-time air quality data of some sort. WRI and Development Seed are helping our community add more data sources to the OpenAQ Platform. This will mean connecting with new partners at air quality agencies around the world, as well as having a team of folks writing data source adapters to existing data sources we have in our “new data” queue. 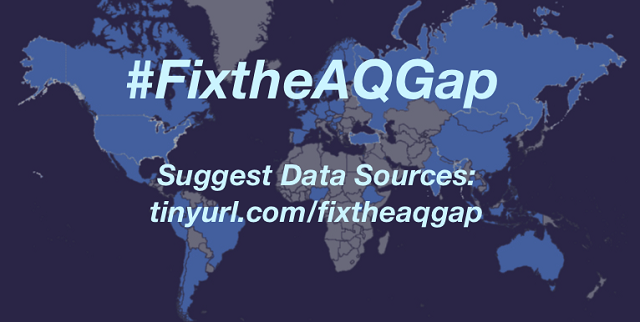 Over the next couple of weeks, we’ll be seeking YOUR input on potential new data sources through our #FixtheAQGap Campaign. It’s a big push to find those air quality data points that are out there but are falling through the gaps. 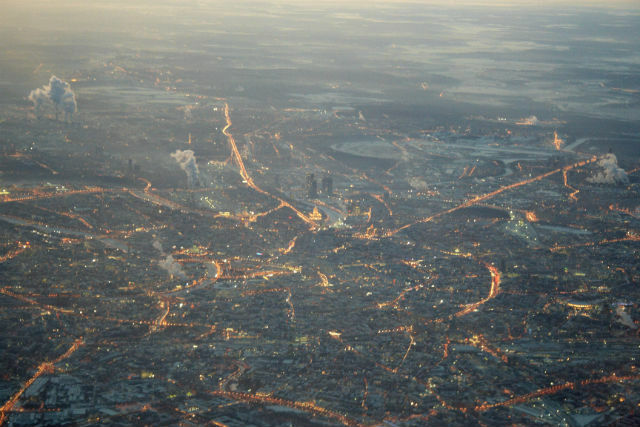 Do you know of air quality agencies we should be connecting with to access open data? Do you know of data sources already out there sharing data? Fill out this form, and let us know! In our GitHub repo, we also have a pile of existing data sources, some of which have missing information (e.g., we can’t find the geographic coordinates for a set of stations, or perhaps a language issue is getting in the way and we can’t properly interpret the information). Check out this spreadsheet to see current gaps where we need help. Or check out our issues on GitHub. We’ll also be making calls out on Twitter, asking for help on specific items. Follow @Open_AQ, @WRIcities, and @developmentseed and help us #FixtheAQGap! Chris Hasenkopf is the CEO and co-founder of OpenAQ.org.